Do you love the simplicity of classic tee-shirts? Does the thought of working with knits make your teeth chatter and your knees tremble? Are the dolls in your life begging you for a fashionable tee, but find you cowering in the woven section of the fabric store? Relax--now you can hold you head high with confidence, thanks to the NOT! For Knits Tee-Shirt PDF Pattern. Specifically designed for woven fabrics, this tee features easy dolman-style sleeves, a rounded hem, a working pocket, and a no-facing neckline. You'll learn how to sew several easy finishes for the hem and neckline, and can even make the tee in a longer dress variation. Thumb your nose at those stretchy, unpredictable knits while you quickly sew up one adorable top after another. End your days of shame and inadequacy, and fill the closets of little vinyl people and their human friends with classic tees in every hue! The NOT! For Knits Tee-Shirt Pattern will allow you back into their good graces--and you won't even need to mention that it has an "Easy" rating. PLEASE NOTE: This pattern was sized on a recently purchased American Girl doll. The pattern may need to be adjusted for older dolls. Recommended Fabrics: Shirt version: lightweight wovens with a drape; light-to-medium weight wovens with a drape for the dress version. Examples are rayon challis, soft cottons, chambray, and lawn. Pattern was easy to use. I noticed some differences from the Wellie Wisher pattern and was happy with the different neckline. I did make some changes to the hemline but this came together fairly quickly and easily. A nice pattern if you don't like knits! The pattern was very easy to follow. I did have to recut the bias piece for the neckline to make it longer - not sure if I didn't measure right or what from the start. I made the dress version and sewed legging and a matching headband to go with and it turned out really cute! Really cute shirt with easy to follow directions. A perfect shirt for those of us who don't like sewing knits! This pattern went together so easily. I really like Forever 18 Inches patterns. Great instructions and lots of tips. Nice to have a basic go-to top. When I read through the instructions I was a little intimidated. The tiny seams that my machine loves to **** into the sewing machine abyss...The tedious steps. However, I was pleasantly surprised at how fast this went. My little shirt turned out adorable! I left the back open and sewed in a 3 1/2" x 1/2" piece of velcro. It leaves enough wiggle room at the bottom of the top to fit any doll when you do it that way. Thank you for a wonderful pattern. 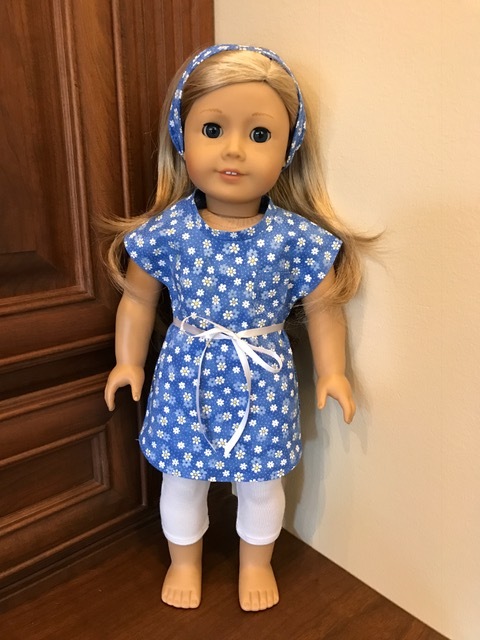 I absolutely dread sewing with knits, so this will definitely be my go-to shirt pattern for my girl's AG dolls.